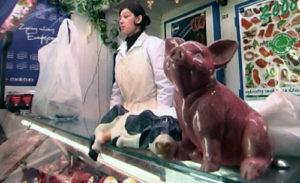 You can buy pork with high animal welfare labels in most supermarkets. 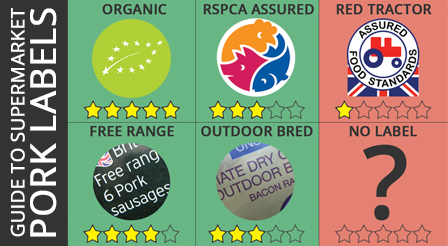 Look for the more common labels, such as Outdoor Bred, RSPCA Assured, Free Range or best of all Organic. Pork with these labels has been raised on high welfare farms, almost certainly in the UK. You can also ask for high welfare at your local butcher, or better still shop at your local farmers’ market, find high welfare online, or join a box scheme. If you’re eating out, ask if the meat is from a high welfare farm. Pigs can roam freely between outdoors and shelter Pigs can roam freely between outdoors and shelter Pigs may be kept permanently indoors but with enhanced space allowances. Fully slatted floors not permitted Sows can roam between outdoors and shelter. Piglets are fattened indoors after weaning Pigs often kept permanently indoors on bare concrete slats. Sow stalls not allowed Pigs mostly kept permanently indoors on bare concrete slats. Download the labelling comparison chart… and put it on your fridge! Both sows and fattening pigs can roam freely between outdoors and shelter. Piglets are weaned no earlier than 40 days, meaning they have much more time with their mothers than intensive systems. No GM food. NB. 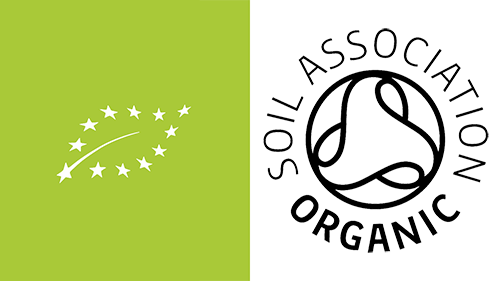 The ‘Soil Association Organic Standard’ is one of only a few schemes that chooses to “set it’s standards even higher than the minimum EU organic requirements”. Both sows and fattening pigs can roam freely between outdoors and shelter. Piglets are usually weaned later; 7 to 8 weeks as opposed to 3 or 4. 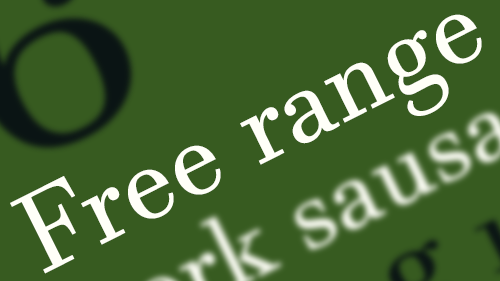 There is no official logo for free range, so look for the words ‘free range’ on the packaging. Fattening pigs can roam freely between outdoors and shelter for around half their lives (up to ten weeks) before being moved indoors into a straw-based system. Sows are free range their whole lives. 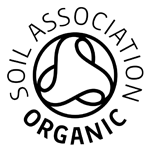 There is no official logo for outdoor reared, so look for the words ‘outoor reared‘ on the packaging. Sows are free range their entire lives while fattening pigs are moved into straw-based rather than intensive systems after weaning. The scheme covers both indoor and outdoor rearing systems. Pigs that are permanently indoors have more space to move and are provided with material such as straw to root around in, unlike factory farmed pigs. Sows are never confined in crates and are given enough room and straw to build nests. Teeth clipping, nose ringing and tail docking are not permitted except in exceptional circumstances. Sows are free range meaning that they can roam freely between outdoors and shelter for their whole lives and are never confined in crates. Sows have access to large bedded huts that provide shelter and a dry lying area. Sows give birth to their litters outdoors in individual straw-bedded shelters called arcs from which they come and go freely. The piglets are free-range with their mothers until weaning at four weeks, when they are moved indoors. 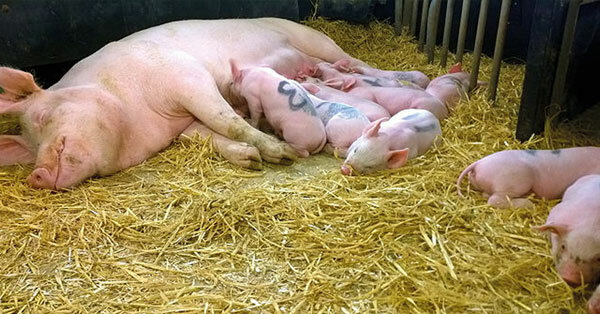 Piglets are moved into an intensive system post-weaning unless the RSPCA logo is present as well, in which case they go into a straw-based system. 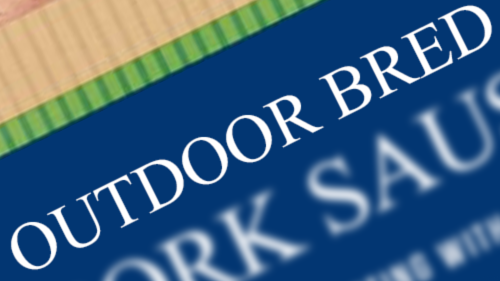 There is no official logo for outdoor bred, so look for the words ‘outoor bred‘ on the packaging. 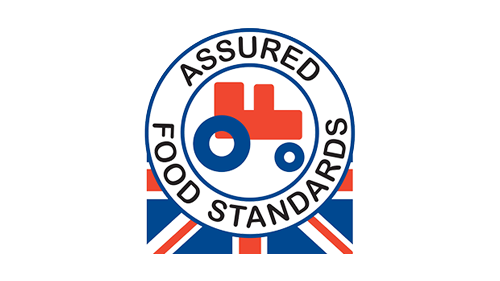 Very little different between Red Tractor and minimum legal UK production standards. It Allows for intensive production and is not a guarantee of good animal welfare. Sows are confined in farrowing crates for up to five weeks during each pregnancy and offspring are permanently indoors with inadequate environmental enrichment, routinely docked tails and routinely clipped teeth. 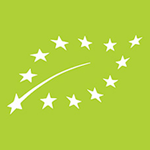 In line with EU legislation except sow stalls are banned. Minimum legal UK production standards. Routine tail docking and teeth clipping is commonplace. Castration is legal but not commonplace. Sows in farrowing crates for up to 5 weeks at a time. Will almost certainly have come from a factory farm . Sows are kept in ‘sow stalls’ for up to the first four weeks of pregnancy then are kept in farrowing crates until the piglets are weaned (a further five weeks). 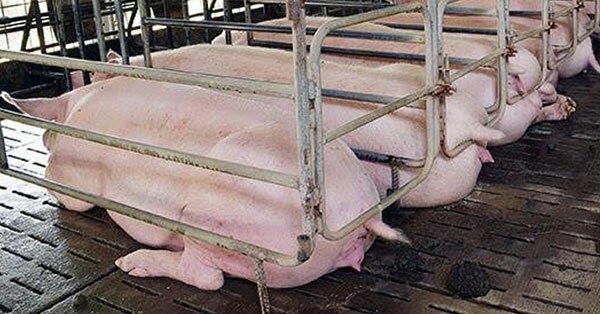 Fattening pigs are kept permanently indoors on slats with no bedding. Routine tail docking and routine teeth clipping/grinding has been illegal in the EU since 2003 but remains commonplace. castration is also commonplace. All of Waitrose’s own brand fresh pork is British and comes from Outdoor Bred pigs as a minimum standard. Having been born outside in arcs filled with straw, the pigs reared for Waitrose’s own-brand fresh pork are moved into ‘light, airy straw-bedded’ barns at weaning. This gives Waitrose a high minimum welfare standard throughout their own-brand fresh pork. All of Co-op’s own-brand fresh pork is sourced from Outdoor Bred pigs on RSPCA Assured farms. This gives Co-op a high minimum welfare standard throughout their own-brand fresh pork. All M&S own brand fresh pork is RSPCA Assured and Outdoor Bred. This gives M&S a high minimum welfare standard throughout their own-brand fresh pork. Within their speciality range they have free range and organic pork too. Sainsbury’s standard range of own-brand fresh pork products are either UK no label or EU no label, giving Sainsbury’s a low minimum welfare standard. Sainsbury’s do not sell products with the Red Tractor logo. Instead, they have use a circular Union Jack logo which merely means the pork is British and can only serve as a guarantee of adherence to minimum UK standards. However, Sainsbury’s ‘Taste the Difference’ range of fresh pork carries both Outdoor Bred and RSPCA Assured labels, meaning that the sows are free range their whole lives and the fattening pigs are moved into a straw-based rather than intensive system. Aldi stocks a lot of Danish pork and pork from the EU with no welfare labels or description of how the pigs were raised. We can only assume that these pigs were raised to minimum EU standards, meaning both sows and fattening pigs are inside, in intensive systems their whole lives. Sows will be subjected to four weeks in a sow stall and five weeks in a farrowing crate during each pregnancy. Fattening pigs will spend their whole lives in barren, crowded pens with only slatted or concrete floors on which to live. Fortunately, Aldi’s ‘Specially Selected’ range of fresh pork has both Outdoor Bred and RSPCA Assured labels. This means the sows are free range their whole lives while the fattening pigs are moved into a straw-based system after weaning. Two thirds of Lidl’s own-brand fresh pork is either UK no welfare label or Red Tractor, meaning that both the sows and the fattening pigs are inside in intensive systems their whole lives. The other third of Lidl’s fresh pork is their ‘Deluxe’ range which all carry either an RSPCA Assured label and the words ‘Outdoor Bred’. This means that these pigs were raised free range with their mothers for one month before being moved into a straw-based system. Sows will be free range their entire lives. Tesco stocks Red Tractor, UK no label and EU no label own-brand fresh pork. This pork will have come from pigs reared to minimum UK and EU standards, respectively, with both sows and fattening pigs being inside their whole lives. This gives Tesco a very low minimum welfare standard in own-brand fresh pork. Confusingly, there is variation in production systems within Tesco’s ‘finest’ range of fresh pork. 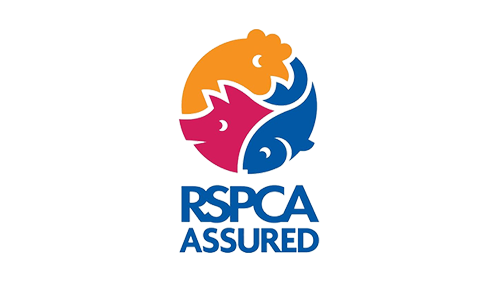 All Tesco’s finest fresh pork is RSPCA Assured apart from their sausages, which carry no welfare label and come from pigs raised to UK minimum standards. Pork products in Iceland’s ‘Luxury’ range is Red Tractor Assured. Pork outside Iceland’s Luxury range is mostly imported from the EU. Morrisons only stocks UK no welfare label or Red Tractor labelled pork making it impossible to buy pork from non-factory farmed pigs in Morrisons. All of their pork is UK sourced, so it must adhere to UK farming standards as a minimum, but are not obliged to go any higher. ASDA’s own-brand fresh pork is all either EU no welfare label, UK no welfare label, or Red Tractor Assured, making all the pork in ASDA factory farmed. Over half of ASDA’s fresh pork is imported from Europe, with sows confined to crates for nine weeks in each 20 week farrowing cycle. Don’t be fooled by their ‘Extra Special’ range, it says nothing about welfare. Much of the best meat comes from independent retailers, butchers and farmers’ markets. Meat from these sources is not always labelled and the best way to find out where it came from and how it was produced is to talk to the person you are buying it from. 1. Do you know where this meat came from – ideally the farm where it was raised? 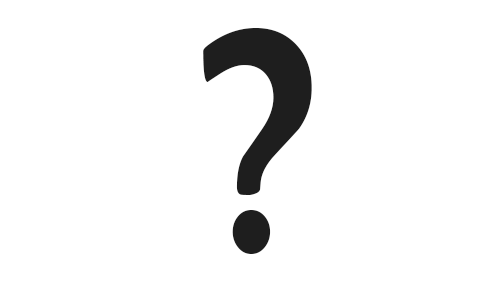 Retailers should ideally know which farm the meat they are selling has come from, or at least which supplier it came from so that you are able to contact the producer. 2. What standards are the pigs raised to? Organic, Free Range, outdoor bred or RSPCA Assured. 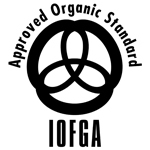 Not all farms will have been certified to any of these standards, but may still produce high welfare pork. Retailers should know the conditions in which the pigs have been raised, which you can cross-reference with the labelling information above. 3. How often are antibiotics used, and in what circumstances? Antibiotics should only be used in essential cases, in other words if the pig is ill and in need of medicine. They should not be used to encourage growth, or simply to keep pigs ‘healthy’. Our very own directory of farms, restaurants, shops & markets helping you find pork that you can trust. A list of the top 4000 award winning local producers, Food Markets, Farmers Markets and Farm shops – all of whom have won major UK awards, certifications and recommendations. Find your nearest local, independently-produced or artisan food & drink. These crates were banned completely in the UK in 1999. However, their use is still permitted for up to four weeks post service in the EU. These crates cause severe welfare problems as the sow is unable to turn around and most have no access to bedding; they are unable to take more than two steps forwards or backwards for a whole month. 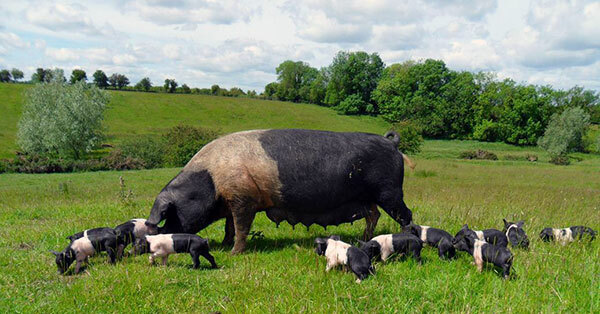 Restrictive pens which prevent the sow from turning around while her piglets are weaning. The confinement and a lack of bedding materials frustrates sows as they’re not able to perform their natural nest-building behaviours. Sows are put into farrowing crates up to a week before they are expected to give birth and for up to a month after giving birth, i.e. confined for up to 5 weeks at a time. These are legal in the UK and under Red Tractor. Outdoor sows are often nose ringed in an attempt to prevent excessive rooting of the ground within farrowing arcs. Nose rings work by the action of discomfort and pain as the sow goes to root with her snout, causing her to stop. In the EU, it is legal to castrate male piglets without anaesthetic, provided it is done before seven days of age. It is estimated that 80% of male piglets in the EU undergo this painful procedure each year. Pigs have a strong instinct to root. Not having enough manipulatable material, such as straw, frustrates rooting behaviour and can also cause injury and discomfort. Inadequate stimulation (barren environments) and lack of space can worsen problem behaviours such as tail biting and aggression. Bedding material provides comfort and an opportunity for pigs to root and forage. This also helps to prevent boredom and stress which, in barren enclosures with high stocking densities, can result in outbreaks of fighting. Tail biting, a behavioural problem in pigs, can lead to serious injury and hence welfare problems. However, tail biting is itself a symptom of other welfare problems, indicating some form of physical or mental stress. Tail docking (cutting off piglets’ tails) aims to reduce the likelihood of tail biting when pigs are older, rather than addressing the underlying causes of the behaviour, e.g. boredom, stress, frustration etc. arising from lack of environmental enrichment and overcrowding. Piglets may have their needle teeth clipped or ground down to remove the sharp ends that can cause damage to the sows’ teats and to other piglets. NB. Both of tail docking and teeth clipping can cause pain as they’re often carried out without anaesthetic. Straw allows pigs to root around and express natural behaviours, mitigating the boredom and frustration that leads to tail biting, thus reducing the need for tail docking and teeth clipping. Due to the system of manure (slurry) removal, does not allow the use of straw or similar manipulable material (illegal). Sows permanently indoors, either confined in crates or crowded pens. 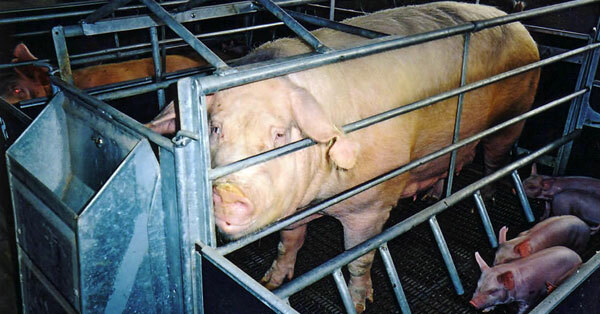 Fattening pigs kept permanently indoors in barren, crowded pens with only slatted or concrete floors on which to live. Intensive systems are indoor-housed with larger herd sizes and stocking densities. The fast growth and overcrowding associated with these systems lead to decreased immunity and increased disease transmission, respectively, and both of these contribute to the metaphylactic administration of antibiotics. NB. 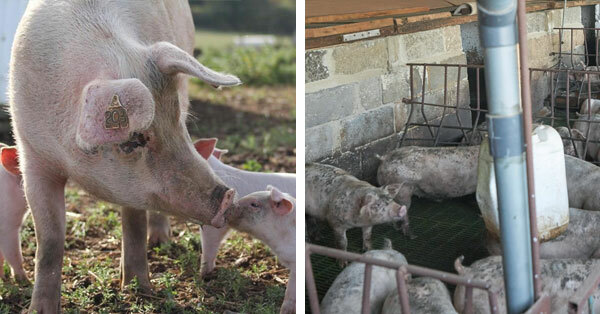 Both indoor and outdoor rearing systems can provide good living conditions, but some farming methods ignore the pigs’ innate behavioural and physical needs. 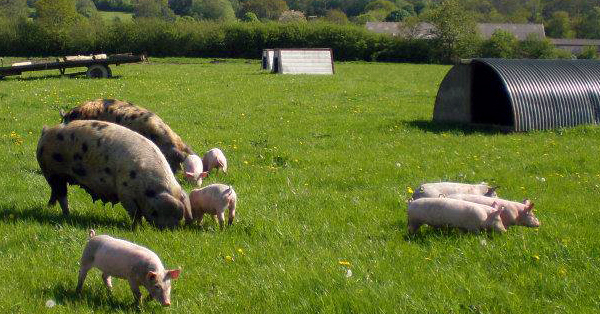 Outdoor pigs have more space, and can explore their environment, forage and hence express their natural behaviours fully.